This massive book clocks in at 133 pages, 1 page front cover, 1 page ToC, 2 pages editorial/SRD, leaving us with 129 pages of content, so let’s take a look! So, this book has been long coming – what we see here is, for now at least, the culmination of the rather cool Anachronistic Adventurers-series by Rogue Genius Games (then still Super Genius Games). The basic premise of the series is pretty simple: Taking a cue from traditional weird fiction and sword and sorcery novels, it’s about people from our world falling into a fantasy context: Essentially, what happens when a navy seal wakes up in Golarion. But the rules ultimately provided more than that – the reason I love this series lies not in the new classes provided, though they obviously are pretty neat. No, to me, the supplemental rules generated have exerted the real draw. From modern firearms to ESP rules, they offer a less fantastic playing experience, should you choose to embark on such a tale; if you’re going for Solomon Kane instead of Tolkien, this very much may be worth a look. The investigator also featured the most elegant, simple research rules for a d20-based system I’ve seen so far – one I gladly have been using and one my players love to death. There’s a reason that installment made one of my Top ten-lists. So yes, as you may have gleaned from this, I have covered quite a few of the classes herein already, so let’s go through these in express-mode, shall we? If you require details, please check the respective reviews for them. The Enforcer would be the professional combatant among the classes. The daredevil allows for surges to supplement his tricks and is the suave secret agent, the daring escapist. The tough would be the brute you just can’t smash down and may also be the nigh-unkillable driver. The Sensitive would be the kind-of-ESP or at least, supernaturally aware person and the Luminary is the brilliant face, the star, the dandy – the class represents, to me, the class I’d give Oscar Wilde. Obviously, the investigator had to be renamed and is now the cogitator, though that in no way detract from the appeal of the class. Now unlike most traditional classes, anachronistic adventurers have built-in archetypes you must choose upon taking the class, allowing for massive customization options: Want a celebrity enforcer? A daredevil cold-reader? A sensitive who fought in the trenches? Well, all of that is possible now. It should also be mentioned that here, we actually get new, previously unreleased material – want to play e.g. someone who has his own devices that improve every level, essentially getting a built-in legacy item? Yup, in here. With pages upon pages of devices and bonuses by the level for a diverse array of slots – whether they be armor or rings. The thing with these archetypes is that they multiply the amount of concepts you can realize with these classes – and that makes them awesome. Which would be a pretty perfect place for me to comment on one thing: This is not just a compilation. There is new material herein and generally, the streamlining that obviously went into the classes has to be acknowledged: From spagyric devices (originally pioneered in Advanced Options: Alchemist) to all new content, this massive book goes the extra mile. The progress-level system for technology-levels is explained more concisely. There is more equipment provided and the relative positioning rules for vehicular combat are downright awesome. And yes, there be vehicle maneuvers herein. Oh, and there’d be the vehicle template. Take a wolf, add this template, you have a wolf-themed vehicle. This template is a stroke of genius and something I hope to see expanded: With unique customization options, for example. Rules for group attitude and diplomacy and my beloved research-rules…all here. Of course, there also would be new feats and advice on running diverse types of campaigns with these rules – whether a full-blown campaign or just one character doesn’t matter – this book has you covered. Editing and formatting are top-notch: One can see the care that went into the making of this massive book and the fact that the small hiccups have been polished off. It’s quite astounding, really – the original pdfs were mostly great, yes. However, at the same time, this book obviously went the extra mile to make everything more shiny and even more polished. Layout adheres to RGG’s two-column full-color standard with a brownish border. Interior artwork consists mostly of stock art that thematically fits the topic at hand. The book’s electronic version comes fully bookmarked with nested bookmarks for your convenience. When a compilation hits sites, I usually tend to be less than enthused. They mean a lot of work for me with not much pay-off: I have to go through all my old reviews and files and compare them to the compilation. This task, as you may note, is pretty tedious and takes time. Thankfully, though, the great 3pps that bless our hobby with cool expansions tend to go the extra mile as well and provide streamlined material, new content…you name it. Heck, last year’s Top Ten saw Raging Swan’s legendary Dungeon Dressing and Wilderness Dressing-compilations score my number 1 spot. This book, thankfully, follows the tradition of carefully crafted compilations and streamlines what was already a great collection of rules further. Why should you care? Well, if you’re like me, you’re a bit of a stickler for mood while RPing. But we *ALL* have this one player who just can’t swallow the modern-day allusions, right? Well, hand such a player an anachronistic character and suddenly, these quips make sense in-game. That’s not the book’s primary selling point for me, though. 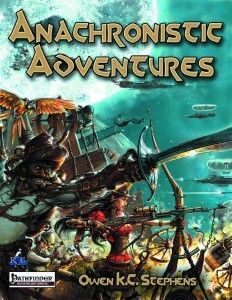 In fact, I urge you to get this even if the concept of Anachronistic Adventurers annoys the hell out of you. Why? Because it’s all fluff. The rules herein can be reskinned and the supplemental rules provided, quite frankly, are genius and can enrich any game – I’m not engaging in hyperbole when I’m saying that some of my favorite rules from the pen of Owen K.C. Stephens can be found herein. Considering his output, that does say something about the quality of this glorious book. Transcending the limitations of its theme by virtue of its great design, sporting superb material galore…this is a superb offering indeed. My final verdict will clock in at 5 stars + seal of approval and I nominate this as a candidate for my Top Ten of 2015. You can get this glorious book here on OBS and here on d20pfsrd.com’s shop!